So you only want Icon mods, not text mods? BTW, I don't see a Tab key on your keyboard. I'm not using them on THAT keyboard, just the keycaps from that one on a regular 60% or TKL. I think Text would look better than Icons. I have some Granite keys to trade, including some of the odder ones (like 3u spacebar), but I also have $$$. gogusrl wrote: ↑ I'm not using them on THAT keyboard, just the keycaps from that one on a regular 60% or TKL. I think Text would look better than Icons. GDE / GKK / GEK or GMK ? GDE, GKK, GEC, and GMC. And that's just the gray shades. Anyway, dunno how I missed the stock ones, now I'm copy/pasting colors in mspaint trying to decide which one goes best with that brown. Oh, sorry. Granite was GKK alphas and GDE mods. 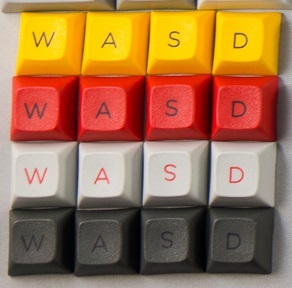 Does anyone have the R1 WASD keys for sale? I would like them all, but most of all I want the red on white. Looking if anyone would like to part with their Granite Tenkey/Numpad set. 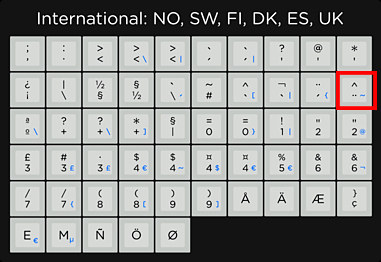 Also looking for an ISO Return/Enter, left shift and 1u backslash. I'm also looking for that numpad, if there's more than 1 out there! I'll take the Gnu, off-center stepped ctrl (capslock) key and += key if you don't mind splitting them up! Hypkx, did you get my PM? Looking for G1 international, have paypal. Plasmodium wrote: ↑ Hypkx, did you get my PM? I got every PM with offers (3) I think now about what I will do next. Please be patience I will respond If I have decided in which way I will sell/split the package. Thanks! For a minute I thought maybe my PM hadn't sent or something. I have a complete Mono Legends Kit up for grabs - £15 shipped in the UK. I don't have much knowledge of EU shipping, but it's not too much more - PM me and we'll work something out. But it also includes (not pictured) mono legended "-" and "_" as well as a 1.25u "\" and a "~" in the darker grey colour for ANSI layouts. Not sure why it has these extras - possibly an earlier/later revision? looking for my final granite, marked in red! But Plasmodium, those mono-legend caps are so tasty! I love them on my Pok3r! You should keep them; one day you'll realize how sweet they are and will regret getting rid of them. Yeah, I considered it... But I'm such a rubbish touch typer that I need to be look where the more obscure symbols are, even on a good day! To be very specific, I only need the 1.75u Shift and 1u Fn from the text pro mods. Shipping will be to Singapore. As above I should point out that I'm not wiling to sell these keys, only trade them for the ones I want. Uk based, but willing to do EU shipping - US maybe, but only if you really have all the caps I need! [Edit:] That third one in the 'have' section has a diagram of a Cherry switch on it in case that's not clear! [Edit2]: I also have a Debian 'swirl' key, but I'm not overly sure it's actually an official Granite cap - it seems slightly lighter in colour. Still, it's up for trade if you have the right caps! I'm looking for a yellow 1.25u text WIN key. Does anyone have those for sale/trade? Thanks Plasmodium! Mono kit arrived safely and looks gorgeous. moley wrote: ↑ Thanks Plasmodium! Mono kit arrived safely and looks gorgeous.